Advantage Gold, LLC is nominated for the 2016 Best of TrustLink in the Precious Metals category based on 5.0 star ratings and reviews. TrustLink and their verified review system make this process trustworthy for every consumer. Advantage Gold’s nomination by TrustLink as the ‘best’ with a 100% FIVE STAR rating is the finest compliment we as a company can receive. Advantage Gold, LLC is honored to be nominated for the 2016 Best of TrustLink in the Precious Metals category based on 5.0 star ratings and reviews. 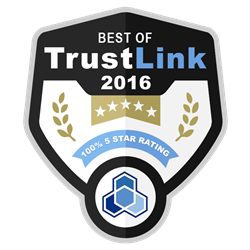 The Best of Trustlink Prize is awarded to the top members in major Trustlink categories based on reviews and ratings. Receiving a perfect 5 star TrustLink rating is considered a high honor and is difficult to attain. When a review is labeled 'TrustLink Verified Review', the customer who wrote the review was engaged in a business transaction with the company. This label is added only if TrustLink can verify that the reviewer’s experience took place. TrustLink was originally founded by the Better Business Bureau in 2008 to provide a forum for consumer complaints and compliments for company services. The site was launched in 2010, and in less than a year it became the most popular rating site in Southern California for Home Improvement, Professional Services, Retail and Web-based businesses. "In today's digital world, it has never been more difficult for consumers to navigate between authenticated and unauthenticated reviews,” stated Advantage Gold Co-Founder Adam Baratta. “TrustLink and their verified review system make this process trustworthy for every consumer. Advantage Gold’s nomination by TrustLink as the ‘best’ with a 100% FIVE STAR rating is the finest compliment we as a company can receive." Advantage Gold is one of the fastest growing and highest rated precious metals companies in the nation. Founded in 2014, Advantage Gold has made customer service and retirement protection the cornerstones of their success and aim to set the highest possible standards of any precious metals dealers in the country. What makes Advantage Gold an outstanding company is their commitment to empowering their customers to protect and secure their retirement through gold and silver investments. With an all out international currency war threatening the U.S. Dollar and the stock market near all-time highs, safety and security are at the forefront for all U.S. retirees. So to celebrate their Best of TrustLink Prize nomination and continue their mission to help protect the retirement accounts of every American, Advantage Gold is giving away 10,000 copies of Financial Warfare Expert and #1 Gold Evangelist Jim Rickards most recent and groundbreaking book, The New Case for Gold, to anyone seeking to protect their IRA, 401(k), or retirement account. Advantage Gold takes pride in being the industry leader in precious metal IRA rollovers. Our experts specialize in converting your existing IRA or eligible 401(k) into gold or other precious metals. We pledge to educate and guide you through the whole process from start to finish. Our main focus is to provide you with the most comprehensive information so that you can make an informed decision about your retirement options. The roots of our company stem from the education side of financial services and that is how we approach each precious metals transaction. Education, understanding, and security are the most important aspects of making sound financial decisions and our talented and trained precious metals experts will guide you every step of the way.